Here’s Day 5 of The Our Lady, Undoer of Knots Novena! Dear Blessed Mother, please undo this knot that stands before me. Please give me the strength and knowledge I need to meet the padding of this test. It has been such a long and stressful road. Allow this knot to break to help me get passed it once and for all. Please Our Blessed Mother Undoer of Knots I ask for your intercession on behalf of my son who is facing an insurmountable amount of student loans and it would only take a miracle for him to pay back and is going to court tomorrow please mediate a reasonable solution Thank you in Jesus your son’s name I thank you!! Please Our Blessed Mother Undoer of Knots I ask for your intercession on #uld only take a miracle for him to pay back and is going to court tomorrow please mediate a reasonable solution Thank you in Jesus your son’s name I thank you!! Please Our Blessed Mother Undoer of Knots I ask for your intercession on behalf of my son who is facing insurmountable student loans that would only take a miracle for him to pay back and is going to court tomorrow please mediate a reasonable solution Thank you in Jesus your son’s name I thank you!! I surrender these knots of my financial struggles and my living situation. Financially I have been struggling all my life because I never believed I deserved a better life. My living situation is dire. At the moment I have no where to live and not near enough money to afford an apartment. 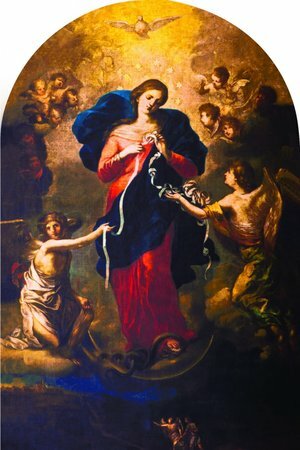 Mary, Undoer of Knots, please take into your care my grandsons, Christian and Hunter, and undo the knots in their lives which have caused them to be isolated and alienated from their family. Please enlighten and fortify not only the children, but the adults in their lives who can help them escape the abusive environment they live in. Please restore peace and love into their lives Mother Mary. Amen. Holy Mother undoes my knots and help Geraldine find work and that their financial situation can be eased. Make Sarah money conscious. In the name of the father. Amen. Heal my marriage in communication, intimacy and finances. Return my children back to Christ and His church. Dearest Mother, please undo the knot of indecision and lack of faith in my son. Undo the knots that stand in his way to the church for himself and his family. I ask this in Jesus name, amen. Mother Mary, undoer of Knots hear my plea. You have already heard my plea of yesterdays Novena and been answered, such amazing Grace! My federal return was deposited in my account! Thank-You, Jesus! Please. My son needs a job. Mary the undoer of knots I lift my financial situation with you right now. The knot that is in the way preventing me from doing well please undo it. The knot that is in my business place that is preventing from getting the respect that I should get please undo. I asked you to intercede for me in Jesus’s name Amen. Please pray for my health, and finances. My health is failing, and my finances are horrible. I live on $ 964 monthly, I’m a retired senior who worked all of my life. I now have breast cancer, hepatitis c, and heart issues. Mary, please break these knots! Thank You Oh, Precious Mother of Jesus. Mary please remove the knot of financial knot in my life. Please allow my finances to flow freely. Lord I have financial knots that need to be u tried.pease bless my son , my family and my marriage. Dear Mary please undo the knot of not trusting in my life , the knot of insecurities about myself. The knot of control. Please heal all those with addictions of the flesh and any addictions , part for my children salvation and my grandsons. Mother Mary,I am praying for family’s health to improve…..Praying for friends intentions….Pray for John Paul & Annie in their health & work….Praying for world peace….